Some pencils in stock have been discontinued or their names have been changed, product is available only while stocks last. 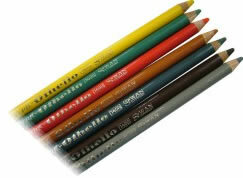 Updated Carb-Othello pencils in a variety of colours are available by the box by special order only. The new colours are; titanium white (52), ivory, grey white, neutral yellow (44), orange yellow (34), indian yellow, orange (54), vermillion red tone (40), carmine red (48), carmine red middle, carmine red deep (50), purple (19), magenta (58), violet light (17), violet deep, prussian blue (22), parisian blue, ultramarine blue , cobalt blue, ultramarine blue middle, ultramarine blue light, sky blue, cyan blue, turquoise blue, emeraly green, emerald green light, leaf green pale, leaf green middle, leaf green, olive green, viridian matt, leaf green deep, raw umber, dark ochre, burnt ochre, burnt umber, bister, caput mortuum violet, caput mortuum violet light, caput mortuum red, English red deep, burnt sienna, French red ochre, dark flesh tint, light flesh tint, sienna, golden ochre, golden ochre light, naples yellow, grey 1, grey 3, warm grey 4, warm grey 5, cold grey 1, cold grey 2, cold grey 3, cold grey 4, neutral black, lamp black payne's grey. Please call +61 (0)7 3852 1911 for further information.